With most monologues it takes less than an hour before fatigue sets in for both the actor and the audience. This one lasts for almost two hours (with interval) and leaves us wishing that it could have been four. David W Rintels’ play first appeared on Broadway in 1974 and in the West End in the following year, performed on both occasions by Henry Fonda. Rintels was present at this performance, taking applause at the end. Based upon Clarence Darrow for the Defense by Irving Stone, the play gives an account of the life and extraordinary career of the legendary American lawyer, defender of the weak and sometimes the strong, but never the strong against the weak. Darrow (1857-1938) was a lifelong opponent of capital punishment and his success rate in defending against it was 102 out of 102, he was a pioneer of progressive liberal thinking and a towering court room orator. The play uses many extracts from Darrow’s own speeches and mingles them with anecdotes about his most famous trials and his private life. He defended Leopold and Loeb (subjects of the play/film Rope), Ossian Sweet, in which he took a defiant stand against racism, and John T Scopes in the infamous “Scopes Monkey” trial, which also inspired a play, Inherit the Wind, performed at this theatre in 2009. 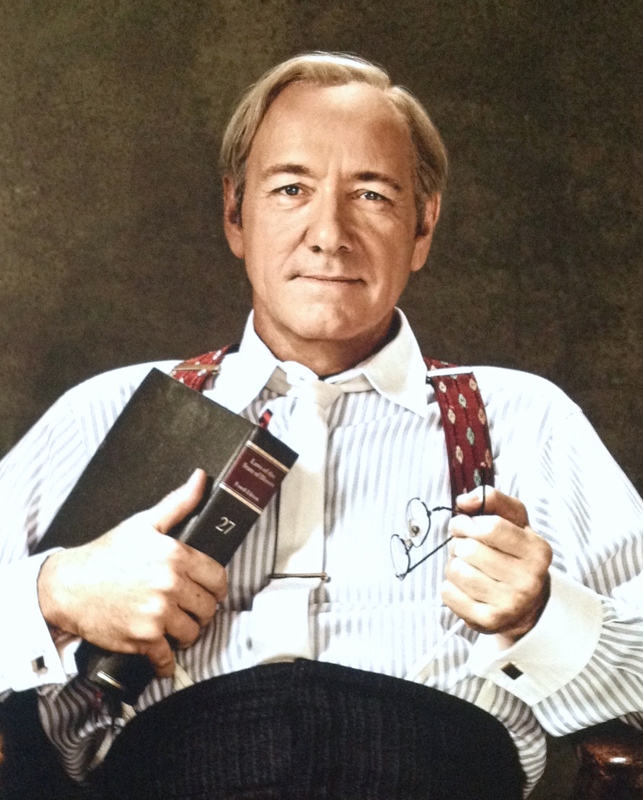 In that production, Kevin Spacey played a character taken to be Darrow and, going from memory, he assumes the same characterisation here – the same voice, stoop, faltering walk – and becomes a man roughly in his 60s/70s, looking back on his life from the time when commitment to his work wrecked his first marriage to old age when he is content to spend all day in his favourite armchair. The set is an old-fashioned office, with files and papers scattered untidily around the desk and floor, Darrow moving them around, finding documents of particular interest and sharing their contents with the audience. The programme tells us that this is the first time that Spacey has performed in the round or in a one-character play, but he meets both challenges effortlessly, addressing members of the audience as if a jury and frequently walking amongst us, making impassioned pleas for justice. Whilst we savour the privilege of witnessing one of the greatest actors on the planet in full flow, we should not allow this to overshadow the quality of the writing. There is not a second of this production that is not totally engrossing. Great things can sometimes crop up in the most unexpected places – like, for example, an angel in a prison or perhaps a theatre in a church. Tucked in behind Harrods, St Saviour’s is still used part time as a place of worship and, for the rest of the time, it is put to several other very worthwhile uses, including serving as a small theatre. An original pointed Gothic arch stands in well for a proscenium arch and performances take place in altogether splendid surroundings. Darren Raymond’s one act play is set in a prison and he takes on the central role of Ryder himself. Ryder is 10 years into an 18 year sentence, hoping for but not expecting parole; he is hostile to prison officers, he refuses to share his cell with any other inmate and he has disconnected himself from his wife and son. His world changes with the arrival of a young first offender, Charlie (Eddie Thompson). Ryder reluctantly accepts him as his cellmate for one night only before proceeding to bully and intimidate him, but Charlie stands his ground and then makes the astonishing claim that he is, in fact, an angel on a mission. An opening scene in the Governor’s office seems to be paving the way for a bleak drama depicting the cruelty of prison life, but, once Charlie sets foot in Ryder’s cell, what we get is a riotous comedy, reminiscent of Porridge. The dynamics of the pair’s relationship are similar to those between the old lag Fletcher and the naive newcomer Godber in the classic sitcom, but here the humour is edgier, slightly surreal and peppered with up to date references. Raymond and Thompson make a memorable double act, their comic timing being spot-on throughout. However, as in most good comedies, the humour is underpinned by the main characters being given depth and becoming fully fleshed out. Ryder is proud but damaged, resentful of the solitude that has been forced upon him, but only responding by adding to it. Charlie is streetwise yet innocent, refusing to allow Ryder to trample over him and never wavering in believing his supernatural claims. There are times when religious themes threaten to encroach on the comedy, but Raymond the writer deftly sidesteps temptations to preach and he comes up with a genuinely touching ending. St Saviour’s does much excellent work in amateur dramatics and deserves wider support, but this should not be the main reason for going to see Prison Wings. This is a professional production and can only be fairly judged as such. Although a little rough around the edges, it is, in terms of writing and acting, top class and it offers a highly entertaining evening. “Good friend for Jesu’s sake forbear, To dig the dust enclosed here. Blest be the man that spares these stones, And curst be he that moves my bones”. So pleads William Shakespeare in the epitaph that appears on his own tombstone, but the man upon whom he based one of his most famous plays has not been allowed to lie undisturbed. The skeleton of King Richard III was found recently after spending many winters of discontent beneath what is now a car park in Leicester and then moved to a more dignified place, suitable for a monarch, even one so widely reviled. Sharon Jennings’ play takes a somewhat quirky look at the discovery of the bones and the arguments as to whether or not, thanks to the work of our greatest playwright, history has been very unfair to this King. Perhaps Shakespeare was doing no more than spreading propaganda in support of Tudor monarchs, who would have seen it as in their interests to discredit the House that they had displaced. Maybe, rather than being the ruthless King that killed to claim the throne and killed more to keep it, Richard was a benevolent monarch who loved his wife and built churches. We are told that there is not a shred of evidence to link Richard to the murders of the two young princes in the Tower, the most heinous of the crimes with which he is associated, and plenty of evidence to suggest that he was intrinsically a good man reigning in very bad times. The play takes the form of a discussion at Leicester Council offices between Len (Toby Osmond), a Council official, Barbara (Kathy Trevelyan), a representative of the Ricardian Society which defends Richard’s reputation, and Ambrose (Steve Blacker), a history professor at Leicester University. Each has an eye to financial gain from the discovery of the skeleton, considering whether their interests could be best served by Richard being portrayed as a hero or a villain. They are joined by the ghost of Richard himself (John Gregor), who, although not seen or heard by the trio, creates a very nasty smell that is blamed on the drains. Possibly being aware that this discussion could be very dry and that Barbara and Ambrose would, inevitably, be dull characters, Jennings writes some sections in rhyming verse and introduces elements of comedy, mainly through Len, who is portrayed as bumbling and badly educated. However, this is where the play is at its weakest, with many of the jokes falling flat and Len coming across as too much of a buffoon even to typify a local government official. Richard’s ghost, dressed in a long, white robe, also appears at first as a comic figure, showing mock indignation at insulting references made to him and throwing in asides about having protested his misrepresentation directly to Shakespeare and, more recently, to Laurence Olivier. Rather than resorting to poor comedy, a better way to make this play livelier might have been to shorten it and thereby give it more punch. At two hours (including interval), it needs cutting by at least a third. The final section is easily the strongest. Here Jennings expounds the theory that the truth about Richard lies somewhere between the views of his supporters and those represented in Shakespeare’s play. She uses the character of Richard’s ghost, no longer a comic figure, to articulate her theory, defend his reputation and admit to his failings. Gregor’s strong, authoritative voice and demeanour give gravitas and credence to her words. It takes some time getting there, journeying through flat debate and weak comedy, but, in the end, there is worthwhile drama. RIP Richard. Every cloud has a silver lining. 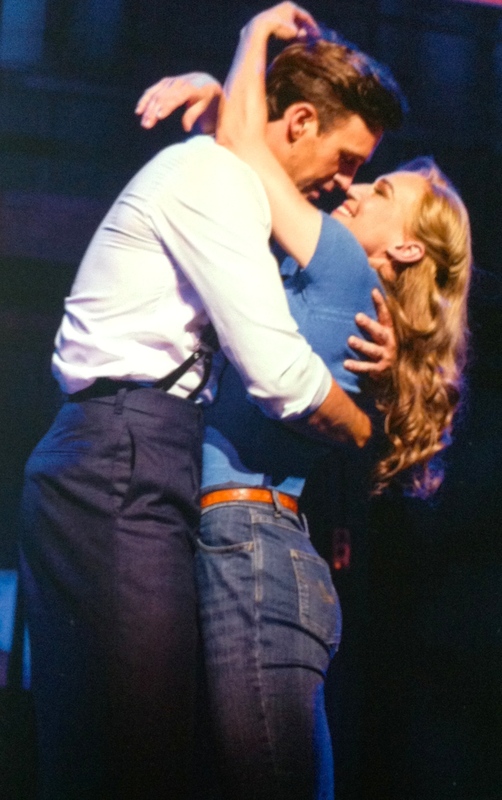 The failure of Tim Rice’s latest musical left a window for this revival, first seen in Chichester last year, to get a West End staging before the next musical moves in in the Autumn, and the early closure of Andrew Lloyd Webber’s latest released Joanna Riding from a bit part so that she can return to her starring role. As a general rule, maybe it is not such good news that new work is nudged out by old favourites, but it is worth making an exception here. With words and music by Richard Adler and Jerry Ross, this show opened in 1954 and the songs – Hey There, Once a Year Day, Hernando’s Hideaway, Steam Heat, etc, etc – play like the 1950s song book. There is not a single dud amongst them. The book by George Abbott and Richard Bissell, something to do with a strike in a pajama factory, is not so hot, more corny as candy in August, but with songs like these, it is hard to care. The show has connections with and some similarities to Guys and Dolls, which Richard Eyre directed at the National Theatre in the 1980s, and he tackles it with similar panache, always avoiding the danger of making it seem like a museum piece. Riding is perfect as a 2014 Doris Day, playing Babe, the feisty strike leader, but Michael Xavier steals the show; playing Sid. the superintendent with one eye on proving himself to management and the other on Babe, he is a real find. There are a host of superb comic cameos and a hard working chorus line that gives exuberant energy to the many big production numbers. Nostalgic and fun, a real treat. The good news is that, thanks to St James’ benevolent advance sales policy, tickets for this cost just a fiver each. The bad news is that they were a rip-off. Even at knock down prices, the auditorium was less than a third full, giving rise to suspicions that other theatregoers are connected to better grapevines than mine and had picked up on the news that this would be a stinker. At the end of a really poor week of theatre, it may seem appropriate that I should end up in a NHS hospital, seated almost on the linoleum floor. In fact, the set is the most realistic feature of this production. Stella Feehily’s terminally ill play is a mish-mash of theatrical styles, ranging from sombre drama to surreal comedy; it is something like One Flew Over the Cuckoo’s Nest meets Carry on Nurse on the set of Casualty. But, sadly, it is the kind of drama to make us laugh and the kind of comedy to make us weep. The plot involves a nonagenarian lady (Stephanie Cole) who suffers a fall and is taken to hospital by her son (Brian Protheroe) who has already been diagnosed with prostate cancer; every plot contrivance that follows is designed to make an unsubtle point about a health service that is on its knees. Guest appearances by Winston Churchill, Aneurin Bevan and the Grim Reaper fail to awaken our interest, breaks in the play for cast members to give us factual lectures fail to convince us and a couple of bizarre musical numbers fail to liven things up in a production that goes onto life support within five minutes of starting. The central tenet, which is rammed home with a sledgehammer over and over again, is that the NHS should remain rooted in the socialist ideology of the 1940s, unchanged, whatever the cost. However, it hardly matters that the messages are nonsensical, because any political view advanced is sure to become discredited by association when something is as bad as this. Finally (I cannot bear to write much more about it), it needs to be asked whether there are grounds for a prosecution under the Trades Description Act. This play hurts A LOT. The first half of James Graham’s new “play” resembles nothing so much as a late afternoon session at a high-powered business conference – a bombardment of facts delivered in an ultra-slick presentation and served up with a lightness of touch designed to put the participants in the perfect mood for cocktails and a splendid dinner. We are told all the ways in which the internet is subverting our privacy every time we use Google, Facebook, Twitter, supermarket loyalty cards, etc, etc, or even when we move from place to place with our mobile phones switched on. We are then shown how all this data can be stored, collated, used for corporate profit and become accessible to almost anyone to use in whatever way they wish. The presentation begins with a highly unusual announcement asking the audience to leave their internet devices switched on. At this point, I have to make a confession: whilst this production was in preparation, I attended a test run of its audience participation elements, with the result that I already knew a large chunk of its content beforehand. Therefore, I accept that it was for this reason that, whilst the usual audience of middle-aged theatregoers, bolstered on this occasion by young techno geeks, were gleefully playing with their smart phones, I sat and yawned. 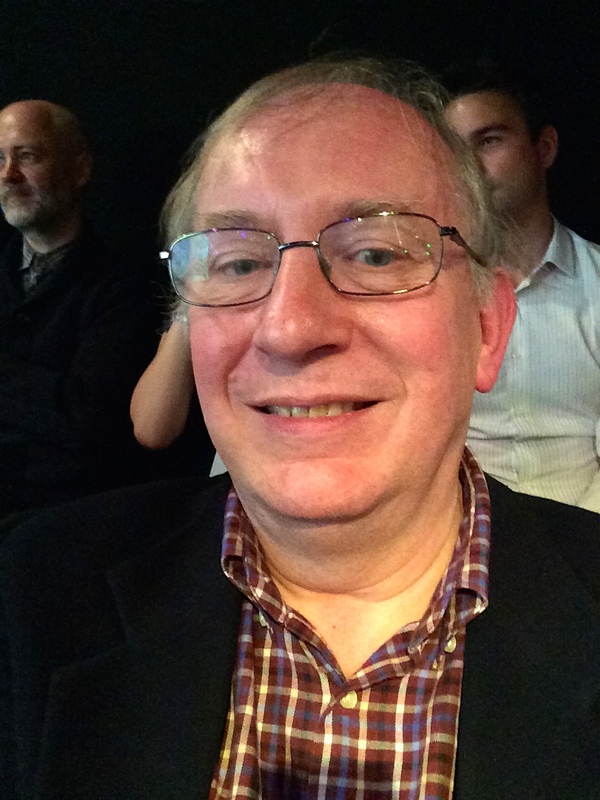 Oh, I also took a selfie (see above), e-mailed it to the Donmar and, childishly took delight in seeing it displayed with others on a screen at the back of the stage. I must also confess to a lifelong aversion to having problems presented without any suggestion as to possible solutions; so, if internet intrusions into our privacy are out of control and individual governments are powerless to legislate to tackle a global problem, what are we supposed to do? Opt out of the modern world and go to live on a desert island maybe? There is still plenty in the first half to cause alarm and consternation, although the impact is diminished somewhat when the device used to convey many of the most striking facts is later revealed to be a deceit. The overlong second half consists mostly of a scripted discussion centring on the Edward Snowdon affair and the potential misuse of private data by governments. The resemblance now is to an edition of Newsnight, albeit one that lacks balance and concision. Snowdon, Wikileaks and The Guardian are presented very simplistically as heroes, all Western governments as villains. At this point, a plot which has promised to surface from the beginning breaks through very briefly, as we see “the writer” (engagingly played by Joshua McGuire) becoming involved with the backlash from Snowdon whilst he undertakes his research. However, this glimpse of real drama turns out to be no more than just a glimmer. Of course, theatre should be able to educate and stimulate debate, but theatre offers opportunities to achieve such objectives through drama and the failure of his production to harness these opportunities and come up with an effective dramatic framework for its messages reeks of laziness. It is simply not good enough to do little more than replicate lectures or television programmes and, to illustrate this, we need look no further than the current West End dramatisation of 1984 which speaks a thousand times more powerfully about the threat of “Big Brother” than anything heard here. The performances by a cast of seven are all good and Josie Rourke’s direction is imaginative, indicating that, if and when her tenure at the Donmar comes to an end, she could find a lucrative career in devising presentations for large corporations. However, in the meantime, she may want to contemplate that rivals such as The Almeida, The Young Vic and Hampstead theatre have raised their games significantly in recent times and this quickly forgettable effort may do little to help the Donmar to regain lost ground. The presentation ends with a request, tongue-in-cheek I assume, not to reveal any of its “secrets”. I am afraid that I may have done so herein, but, if it is alright for Edward Snowdon to blab, why not me? A double hander pairing a Hollywood star, best known for jaunts around the Amazon jungle and the Egyptian desert, with an elder statesman of British classical theatre seems, at first sight, something of an oddity. 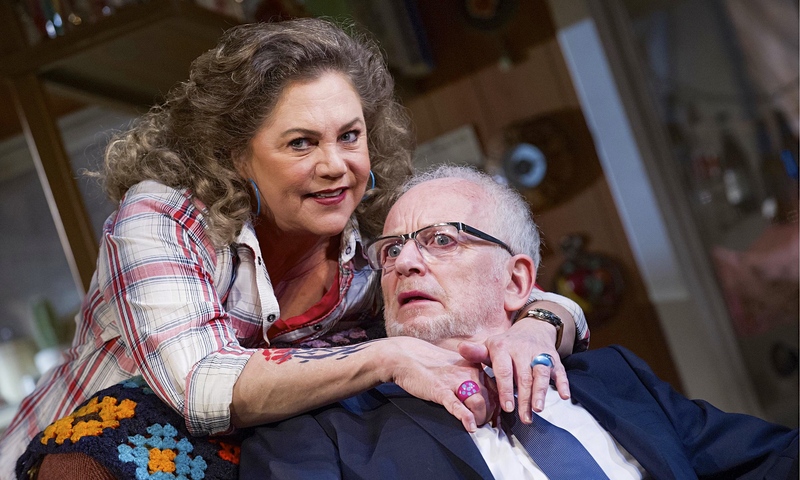 However, Kathleen Turner’s stage credits now take up more space in the programme than her film ones and Ian McDiarmid shows a deft touch for light comedy not often seen before. She is “trailer trash”, living in Bakersfield, California, he is a New York City art expert assigned to determine whether or not a painting which she has chanced upon is an original Jackson Pollock. The early comedy, which comes from a clash between her brazenness and his pomposity, is bright and promises well, but Stephen Sachs’ play then moves into a debate about what is genuine and what is fake, both in art and in life. In short, it is picking up the baton from Yazmina Reza’s Art, but not running very much further with it. Unfortunately, the dialogue often feels unnatural and the development of the two characters is inconsistent, so that Polly Teale’s production relies heavily on two charismatic performances to carry it through dull patches. The plot also dries up very early, leaving the play to meander on until it fizzles out like a damp squib. Tom Piper’s set, the interior of a trailer, is a marvel of detail, littered with every conceivable form of bric-a-brac. a fridge barely visible under magnets and prints of paintings that hang as monuments to bad taste; but, sadly, the set deserves better than the play that it is home to. Running at just 75 minutes, the production is 25 minutes shorter than stated in the programme, which suggests that a considerable amount of cutting could have already taken place during rehearsals; with a little more trimming, the play could have been fun in a small fringe venue, but in the West End, it feels overblown and, of course, overpriced.